Hydro Hotel Hotel81 bedrooms with dramatic sea views over the English Channel and towards Beachy Head. The Hydro Hotel is the nearest to the South Downs Way and within walking distance of the start of the 100 mile route through the South Downs National Park. The hotels features 2 restaurants, the Crystal and Conservatory, and guests may relax in our luxurious lounges. Facilities include an outdoor pool, Croquet and putting green. Celebrating over 120 years of fine cuisine and exceptional personal service, the Hydro Hotel is renowned for exceeding our guests' expectations. The Crystal Restaurant serves a more traditional cuisine with all dietary requests catered for. The Conservatory, with views over the grounds and the sea, offers a more brasserie informal setting for guests to enjoy. Full lounge and room service menus provide either formal or informal meals and light dishes according to your appetite and preference. 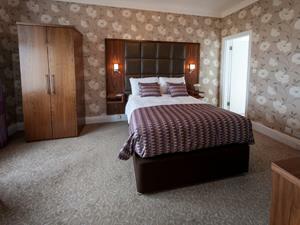 Classic double bedroom sleeps 2 with en suite facilities. Our double bedrooms are perfect for a leisure break for 2 relaxing in the bedroom or in the hotel public areas or laying by our heated outdoor pool. Complimentary WiFi, Colour TV with remote control, direct dial telephone, tea and coffee making facilities, hairdryer, dressing table, luxury toiletries, crisp linen, fluffy white towels and free onsite parking. The rate includes accommodation, full traditional breakfast and VAT at 20%. Dinner can be booked at £25.00 per person in the Crystal restaurant or informally in the Conservatory restaurant with views out to sea. Sea view double bedroom sleeps 2 with en suite facilities. Classic twin bedroom sleeps 2 with en suite facilities. Sea view twin bedroom sleeps 2 with en suite facilities. 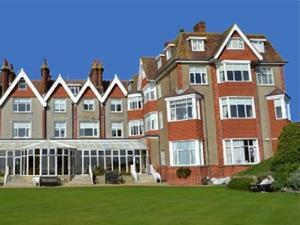 81 bedrooms with dramatic sea views over the English Channel and towards Beachy Head. The Hydro Hotel is the nearest to the South Downs Way and within walking distance of the start of the 100 mile route through the South Downs National Park. The hotels features 2 restaurants, the Crystal and Conservatory, and guests may relax in our luxurious lounges. Facilities include an outdoor pool, Croquet and putting green. The Hydro Hotel has 4 private dining and meeting rooms which regularly accommodate small celebrations and intimate parties or conferences from 10 to 120 guests. Exclusive use is also available for those special larger events. Spacious lounges and a large conservatory overlooking the hotel garden and sea are a particular feature of this well established hotel. Ample parking is available. Follow A22 until joining A259 Upperton Road. At roundabout by railway station turn right into Grove Road. At the end of Grove Road bear right into Meads Road and follow this road until you reach St.Johns Road. Turn left and follow until you reach Mount Road on the right. The hotel is situated on the right.